Tata Zest Pre- 2014 Auto Expo unveil: In Pictures! Like most other sub-4 metre sedans, the Zest doesn't look very proportionate. It gets a long bonnet and a short boot. But the strong shoulder line and an upswept lower character line gives the Zest better road presence. It gets largest in class 15-inch wheels too. The design of the alloy wheel isn't exciting, but its size certainly helps the Zest's stance. 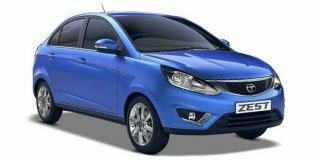 At the rear, the Tata Zest has LED tail lamps, a well-defined bumper and boot lid with a thick chrome line that spans across the width of the car. The Zest packs a Harman audio system on the top of the line XT trim. It comes with a touchscreen interface and also gets voice activated command. It supports Bluetooth telephony, reads out your text messages and has a reverse guidance system as well. Even the climate control can be adjusted via the touchscreen. The cabin is quite spacious when compared to other cars in its class. However, it does lack a bit when it comes to storage spaces and cup holders.